New York Times Bestselling Author, A.J. 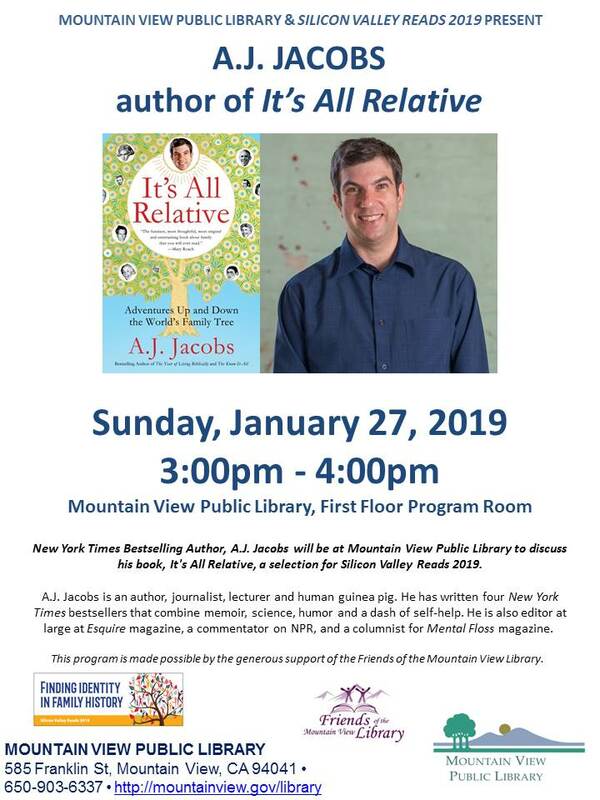 Jacobs will be at Mountain View Public Library to discuss his book, It's All Relative, a selection for Silicon Valley Reads 2019. This year's theme is Finding Identity in Family History. Everyone has a family history - some they know and some they have yet to discover. The surging popularity of genealogy research is encouraging more people than ever to find out more about their ancestors and how their actions and decisions affect who we are today. A.J. Jacobs is an author, journalist, lecturer and human guinea pig. He has written four New York Times bestsellers that combine memoir, science, humor and a dash of self-help. He is also editor at large at Esquire magazine, a commentator on NPR, and a columnist for Mental Floss magazine. Silicon Valley Reads is proud to engage our community in a discussion of this fascinating topic and to introduce readers to three outstanding books that tell the personal stories of individuals whose lives were changed as a result of learning new and unexpected things about their families. Visit the Silicon Valley Reads Website to learn more about this year's theme.